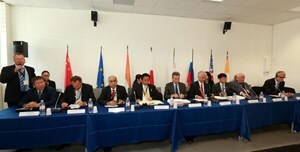 A press conference, attended by some 20 journalists, followed the Ministerial-Level Meeting. They said it in different words and they said it in different languages. But it all came down to the same message: ITER is complex, ITER is challenging, but we need ITER and we are confident in its success. 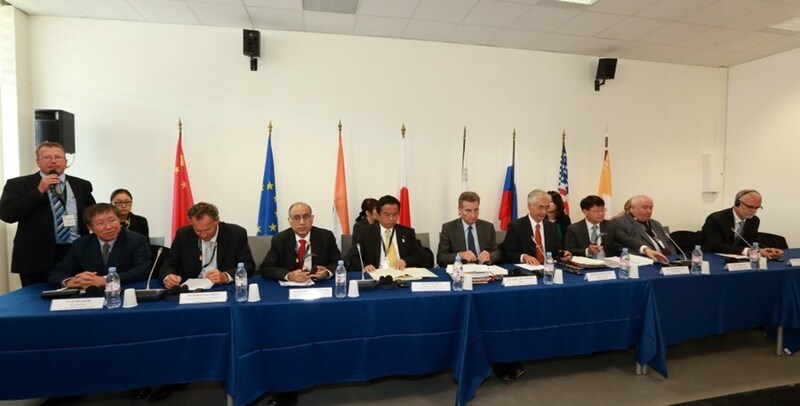 The press conference that followed the Ministerial-Level Meeting gave European Commissioner Oettinger, ITER Director-General Motojima and every Head of Delegation an opportunity to put ITER into context and explain the challenges the project is facing. All agreed that, in the words of one Head of Delegation, "witnessing the progress of construction as we did this morning is an important element in understanding and assessing the project." The press conference was attended by some twenty different media, among them TV crews from France, Russia and Korea (approximately 40 journalists in all). Newspaper headlines the next day were exceptionally positive—in the spirit of this banner on the front page of the area's regional daily La Provence: "World unites around ITER."